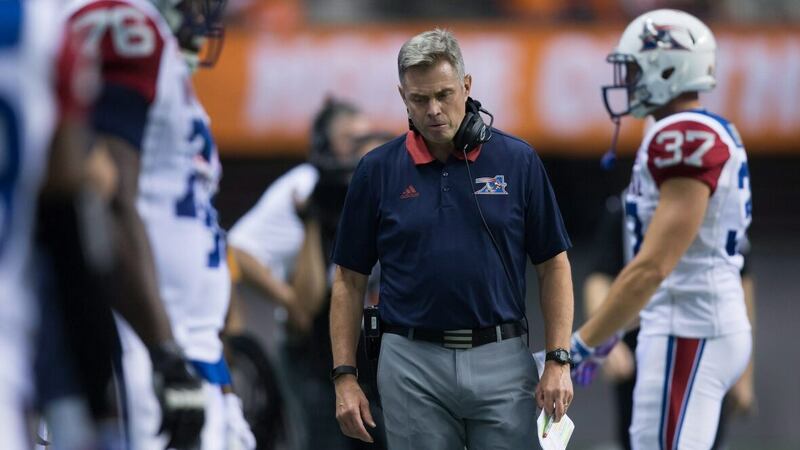 The Montreal Alouettes have fired head coach Jacques Chapdelaine and defensive co-ordinator and assistant head coach Noel Thorpe. The team says general manager Kavis Reed will serve as head coach until the end of the season. Quarterbacks coach Anthony Calvillo will take over offensive co-ordinator duties while defensive line coach Greg Quick will handle the defence. The Alouettes are 3-8, have lost four games in a row and sit third in the weak CFL East Division. The moves come a day after team co-owner Andrew Wetenhall warned there may be changes if the club does not start winning games and make the playoffs for the first time in three years. Chapdelaine was promoted to interim head coach when Jim Popp was removed last September with the team mired in last place at 3-9. He took them to a 4-2 record over the final six games, but it was not enough to secure a playoff spot. The interim tag on is job title was removed after the season, and Reed was handed the general manager’s job when Popp was fired. Chapdelaine was the team’s fourth head coach since Marc Trestman’s five-year stint ended after the 2012 season. Neither Chapdelaine, Dan Hawkins, Tom Higgins or Popp could produce a consistent winner. Thorpe was with the Alouettes on and off since 2002. Defence has been the team’s main strength since he took over as co-ordinator in 2013. It has been the offence, which Chapdelaine ran, that has struggled. The Alouettes were held to six points or fewer in two of their last four games.